Tag line: "In 1978, the US government waged a war against organized crime. One man was left behind the lines"
Trivia: The scene of Joe Pistone practicing on the FBI's firing range was inserted at the insistence of the studio, who wanted a shot of Johnny Depp firing a gun for the movie's trailer. More than a solid crime film, Donnie Brasco, like Goodfellas before it, is a window into a world most of us will never know. 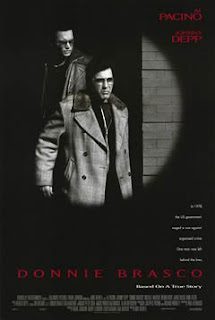 Based on the true story of an FBI operative who successfully infiltrated the New York mob in the 1970s, director Mike Newell’s Donnie Brasco relates the tale of agent Joe Pistone (Johnny Depp) who, assuming the identity of a fictitious diamond expert named Donnie Brasco, is accepted by the infamous Nonanno crime family as one of their own. His “in” Is assured the moment he gains the trust of Lefty Ruggiero (Al Pacino), a hit man for the mob and a well-respected member of the organization. With Lefty’s help, Donnie rises quickly through the ranks, but the longer Pistone plays the part of a gangster, the deeper he gets into the role. Before long, he’s alienated his wife (Anne Heche) and children, and is spending more time with the mob than away from them. Along with his ever-worsening domestic problems, Pistone also struggles with the realization that, when he finally does come clean, it will more than likely mean the end of the line for Lefty, who personally vouched for him. Under incredible pressures from all sides, the fine line separating Agent Pistone from his alter-ego, Donnie Brasco, slowly fades away. As Pistone interacts with Lefty and the other members of the family, we're given a glimpse of just how appealing the “life” of a gangster can be. Aside from the power that goes hand-in-hand with the lifestyle, there’s also the camaraderie, the comfort in knowing you belong. Eventually, this feeling gets the better of Joe Pistone. Wonderfully portrayed by Johnny Depp, Pistone begins this undercover assignment in full possession of his law enforcement skills. During one of the initial sit-downs with his FBI contact, he gives a report about his first meeting with Lefty. “I’ve got my hooks in him”, Pistone tells his fellow agent, “I got my hooks in that guy”. As the film progresses, however, we start to wonder if it isn't the other way around, with Pistone losing sight of his objective, and getting personally involved in the inner workings of a crime family he’s supposed to be infiltrating. Pistone develops a deep friendship with Lefty, and goes out of his way to take care of the aging mobster. Lefty even looks on young Donnie Brasco as if he were his own son. “I die with you, Donnie”, Lefty says at one point, and the way he says it, Pistone knows it’s the absolute truth.